Who doesn’t like to “have” to go shopping? Right?! That’s one of my favorite parts of shooting styled stock…. getting to shop for the perfect props that pull together the amazing shoots that I have pictured in my mind. I have fined tuned my process here and I think I have it down to a pretty flawless system, and definitely have my “prop circuit” that I shop on the regular. Want to know what it is? Target (duh): I always hit up the Hearth & Hand, office decor section and the amazing new Opalhouse section. My Target has the best center display with all the best things, which makes it super easy. PRO TIP: I always check out the clearance sections, I think each store places them around in different areas so scope them out, they often have some great deals. Don’t forget to check Cartwheel too! You can search each thing by using the barcode scanner in the app and it will pop up with an Cartwheel discounts to automatically add to use at checkout! Don’t forget the Dollar Spot! Especially if you are looking for seasonal items, you can usually find a few sweet finds that are $1-$5. Hobby Lobby: I don’t know for sure but I’m thinking that they may use some of the same suppliers as Magnolia Market, if not, there are some really good look alike out there! PRO TIP: check the clearance spots around your store. If it’s not on sale, check back in a week or so OR use the 40% off coupon. There are tons of Hobby Lobby hack posts out there with sale schedules, tips and tricks etc. Also, while you are here, grab a few foam whiteboards if you don’t have them already! Kirkland’s: This store is like a hidden gem, at least I think so! I always would forget about it and then I realized that if you are on the #joannagaines wagon, this is the place to keep in rotation. PRO TIP: go straight to the back walls and check out the clearance. 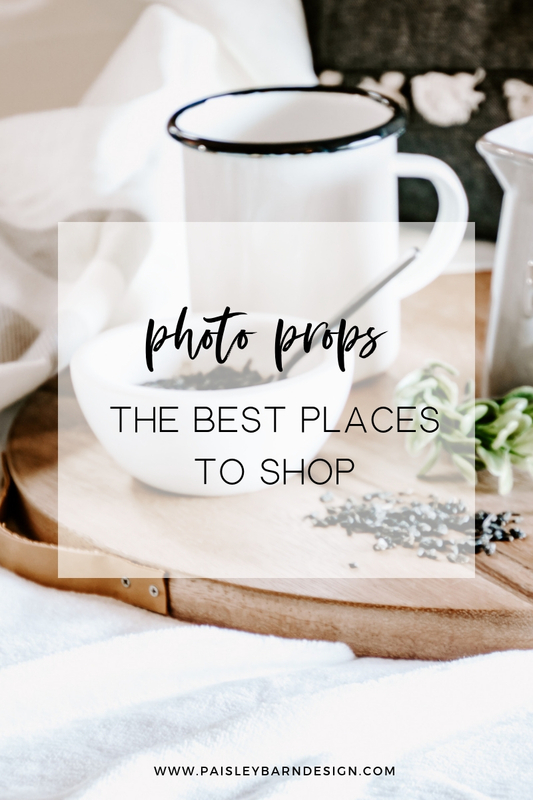 They have the BEST deals and cutest little knick nacks, perfect for little accents in your photos! Marshall’s/T.J. Maxx/Home Goods: I always lump these into the same category, even though they are 3 separate places. I usually hit them all up checking the home decor, office, and pillow/blankets. Always looking for pieces that have texture to use for backgrounds, add layers etc. I like to reuse many of my props, but always find at least 1 or 2 focus pieces that will give the photos sort of an “anchor”. That’s it friends! If you see me out prop shopping, you will find me in one of these places. Happy Shopping!